I’ll never forget seeing photos as a kid of these crazy cave houses in Turkey. I thought there could not be a more distant, exotic place, and I never imagined I could one day visit them, much less stay the night in one! The landscape of Goreme is made of a very soft rock which has been artfully formed by centuries of wind and water erosion. And people have been carving homes and pigeon coops into the rock for just as long. 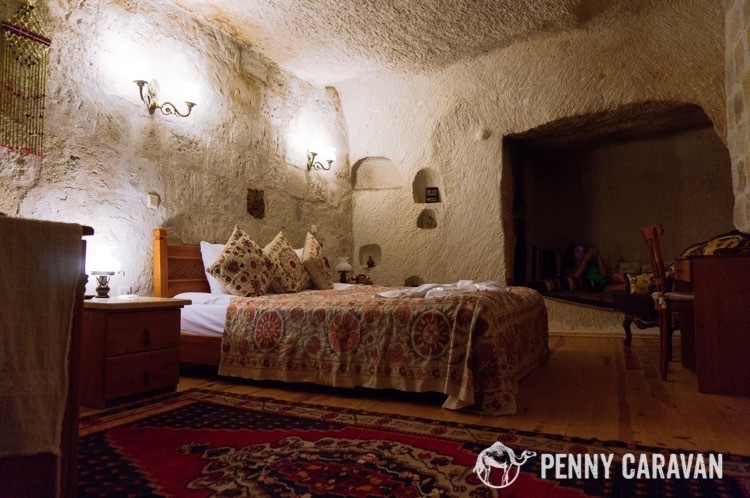 The formations are called “Fairy Chimneys”, and many of the hotels in the area offer fairy chimney rooms, some of them with ancient paint on the ceilings as this entire area of Turkey is dotted with Byzantine-era chapels. 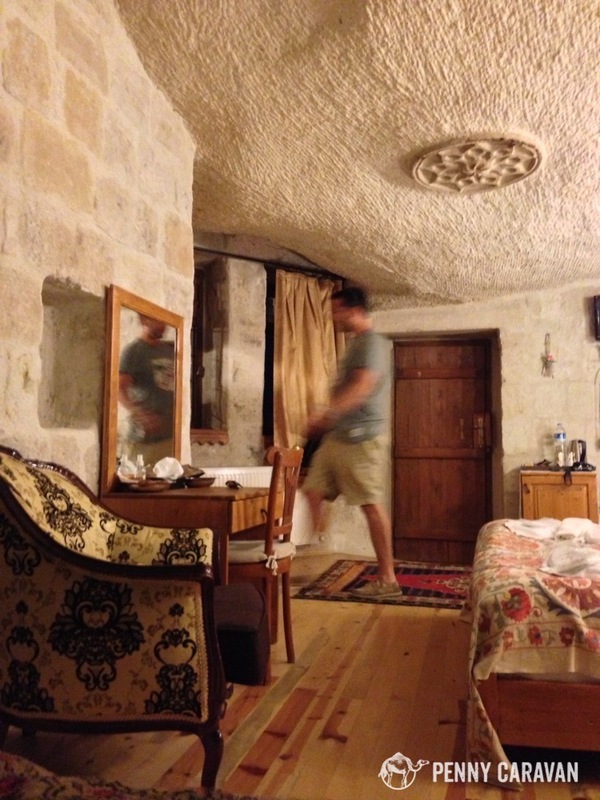 On our first visit to Goreme in 2013, we were elated to get to stay at the romantic, family-run Nostalji Cave Suites. Location: Nostalji is located near Goreme’s “Look-out point” where many people climb to see the sun set. From the city center, it is quite an uphill walk to get to the hotel, but most of the hotels in Goreme will be in a similar location. We never had to take a taxi, but it is easy enough to get one if you need to get back up the hill quickly. 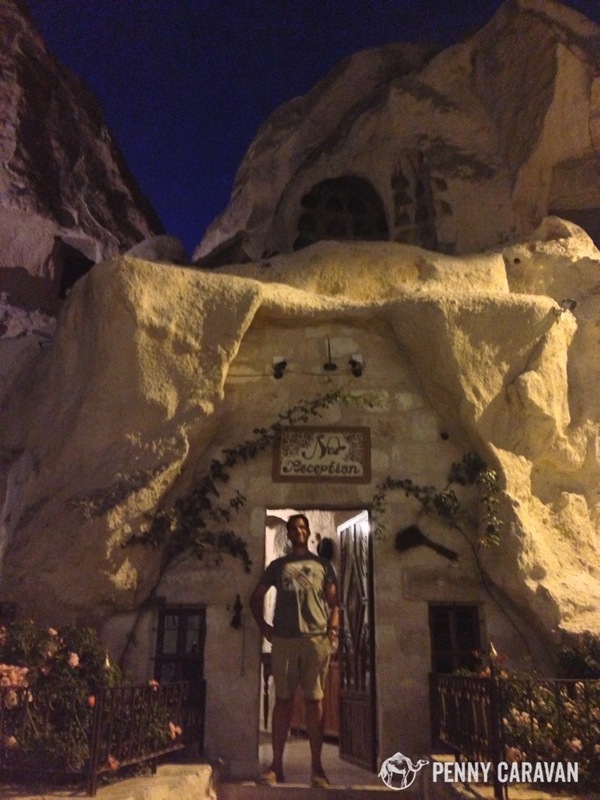 Goreme is a very safe and laid back place, and we felt completely comfortable walking around late at night, taking our time to make it up the hill. Room: We stayed in the “Sirahane Room” which was the wine cellar of the original house before it was converted to a hotel. 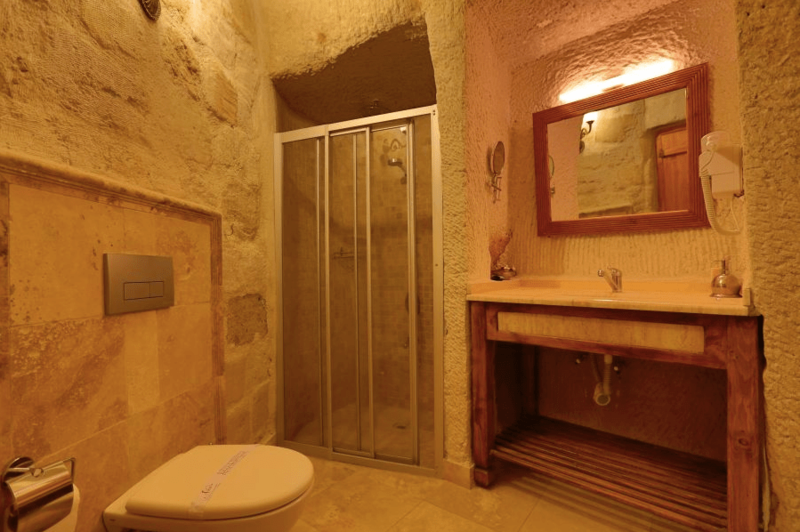 It had a comfortable queen bed, a lounge carved into the wall, a wardrobe and desk. Because it’s a cave, there is no air conditioning but we felt that the temperature was very comfortable (we were there in September). The bathroom was very nice and had hot water. There was free wifi which worked great in our room. There is a mosque just across the street, so the muezzin may wake you up pretty early. I didn’t mind because I didn’t want to miss a single sunrise in this surreal village. 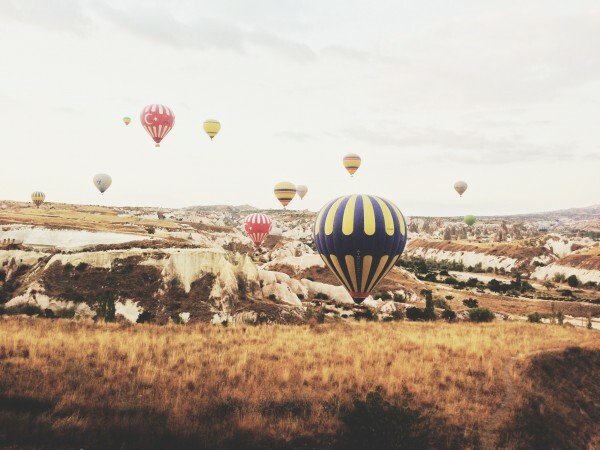 The balloons take off nearly every day here, so rise early and go to the terrace to enjoy the magical view! 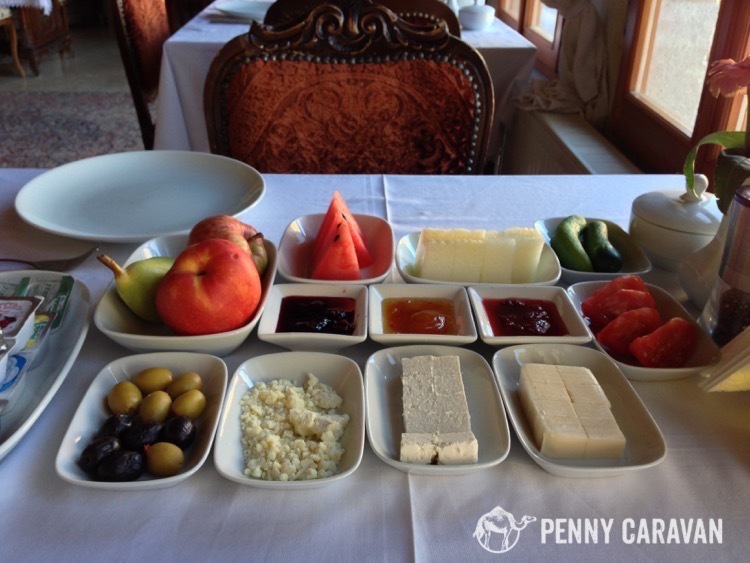 There is a restaurant where complimentary Turkish breakfast is served, consisting of breads and cheeses, fruit, yogurt, cucumbers, tomatoes and olives. At dinner, they set up tables on the terrace and let me tell you now, you should definitely eat dinner here—even if you’re not staying at the hotel! 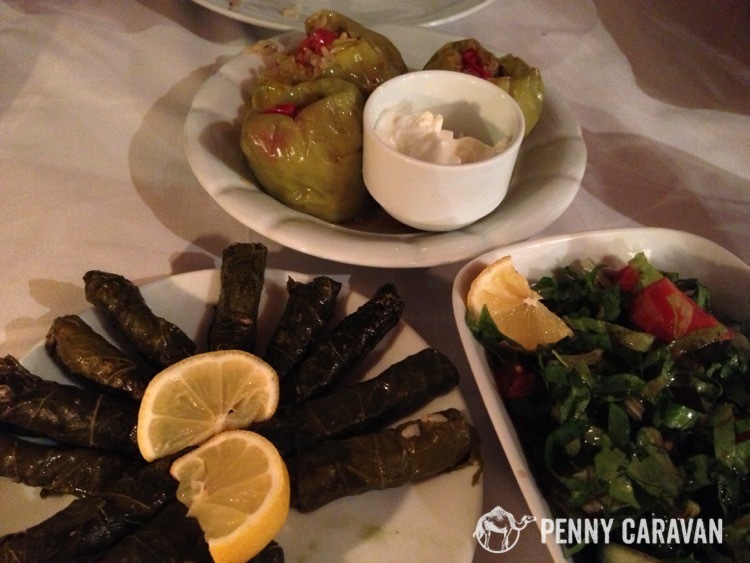 It’s one of the most highly rated restaurants in Goreme and the Dolmas and Testi Kebab are the best we had during our whole trip. Breakfast at Nostalji Cave Suites. 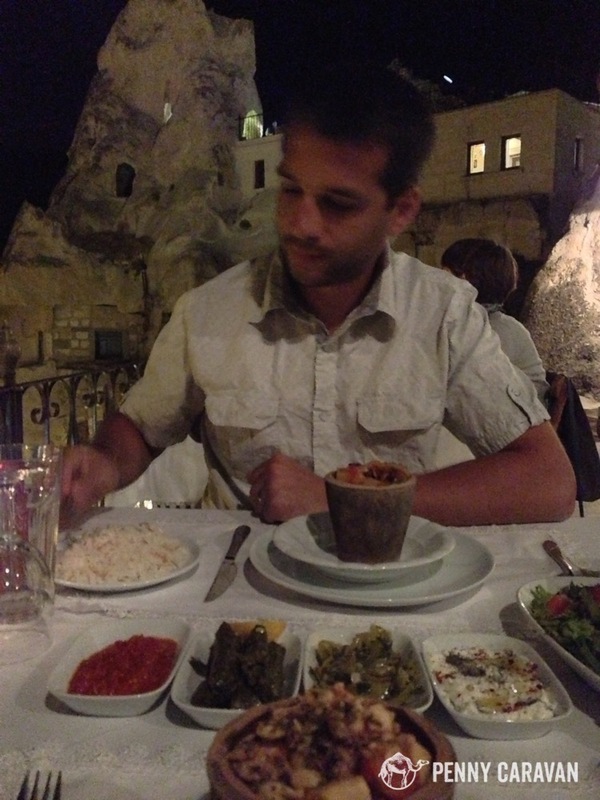 Dinner on the terrace at Nostalji Cave Suites—testi kebab cooked in a clay pot, served with dolmas and salads. 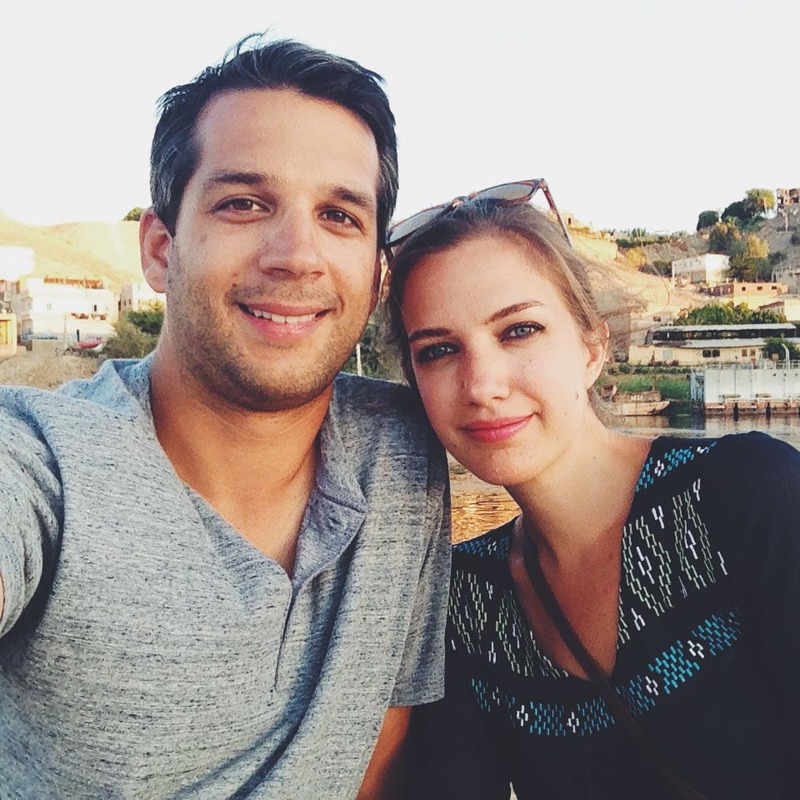 Staff: Our host, Emin, was so helpful in arranging transportation and activities for us. He booked our tour and balloon ride, gave us maps and directions to the nearby attractions, and had our laundry done quickly. I believe his wife was the cook, and his two charming boys serve as the waitstaff at the restaurant. 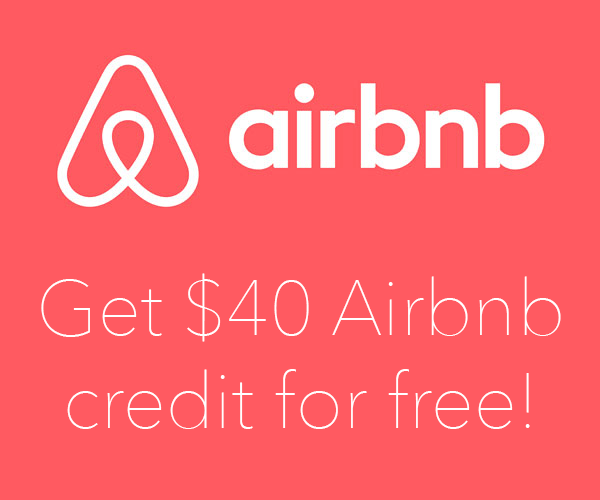 In conclusion: Don’t settle for a cheaper hotel in the valley. 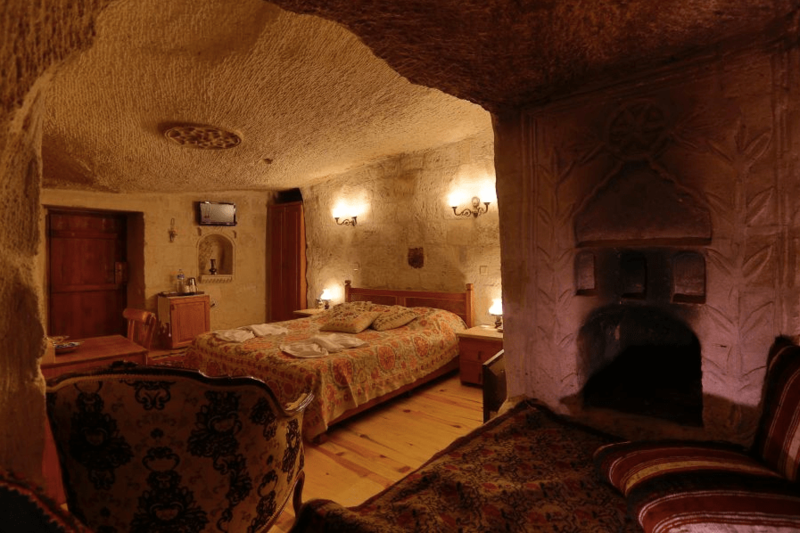 You’re going to Goreme—go all the way and stay in a cave suite! 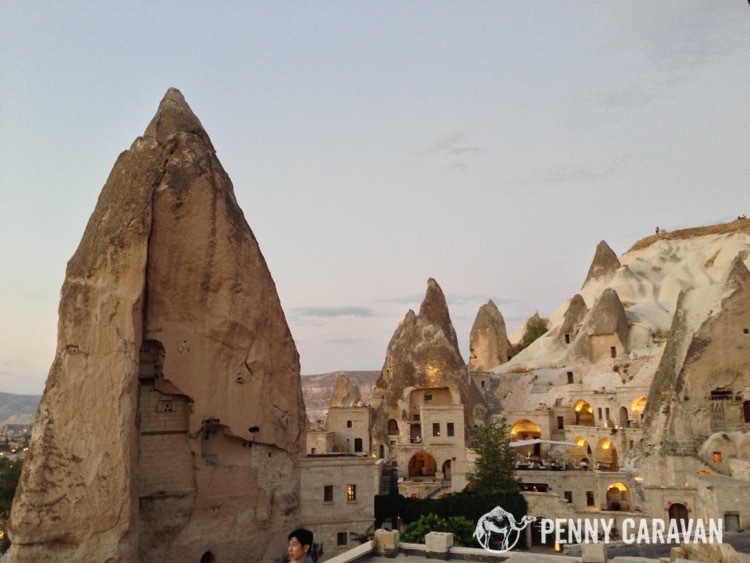 It was one of the many things that made our trip to Goreme an unforgettable dream come true! 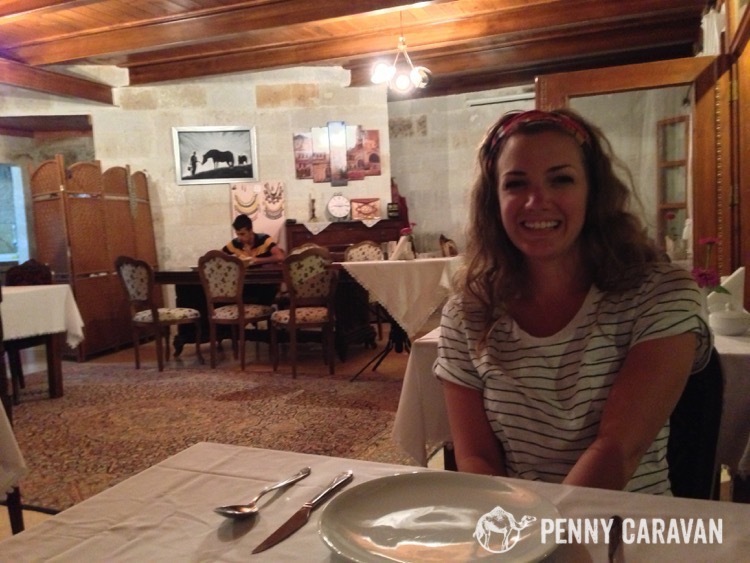 Nostalji is a great place to base your Cappadocia adventure. From here, you have easy access to the city center and all the attractions. If you’re looking to socialize with other travelers, or if you’re visiting in the heat of summer and need a pool, you may appreciate one of the bigger hotels that have more activities and amenities for their guests. But if you’re looking for a small, romantic place with perfect sunrise views and home cooked meals like Grandma makes them, Nostalji is the place to be.